It's only a matter of time. Yeah, we've seen all of the television shows and movies. We've read the comics. We've even played all of the video games. Zombies will eventually overrun the world and we'll be forced into an epic struggle for our lives. The ghoulish creatures will hide in every dark corner. They'll be creeping around in every seemingly safe close. And they're definitely going to be scuttling around underneath every bed. What are you going to do to prepare? We're going to make sure to study up on our rules of the zombie apocalypse! We want to know everything that there is to know about zombie attacks, which is why we love this handy Zombie Attack Party Cup. This decorative glass is the perfect way to brush up on your zombie defense skills. It's a novelty glass that comes with all of the rules to avoid an untimely death at the hands of one of those gibbering ghouls! 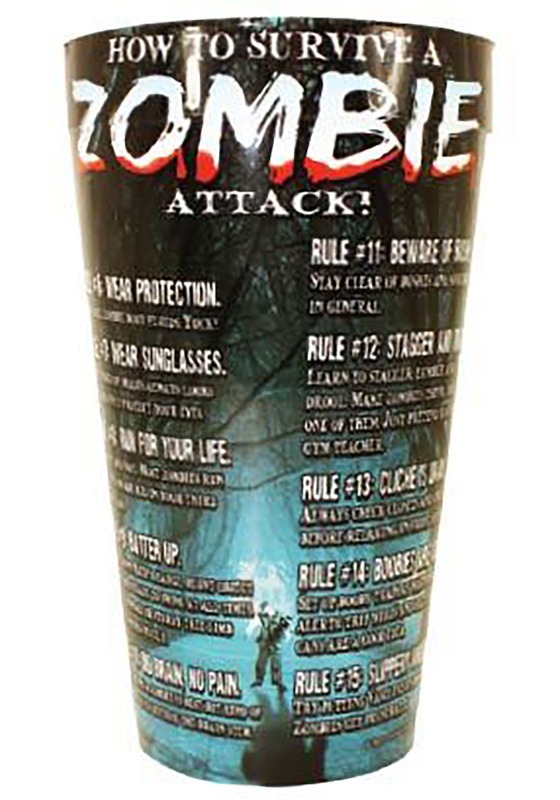 You can fill it with orange juice and study up while you have breakfast, or fill it with soda and keep it with you during movie night as a constant reminder of the proper actions to take during a zombie attack! If a deadly apparition does happen to appear, then all you need to do is consult your glass and you'll know exactly what to do!